Trading in Dwarf Fortress first occurs in the first autumn after establishing your fortress, with the arrival of the Dwarven caravan. Trading is a good way to acquire resources that are not available or are rare in the local area. It also allows for more freedom in selecting starting gear or purchase of additional skills for the expedition party, because items can always be obtained through trade later. Building a trade depot is a pre-requisite for trade with caravans that arrive at your fortress. While it may be convenient to build a Trade Depot outside at first, it is usually a really good idea to move it inside or build walls, bridges and other fortifications around it to protect caravans and your goods from animals (guzzlers), thieves and goblins. If your trader has Novice or better Judge of intent skill, there will be a line added below the merchant's dialogue describing the caravan's attitude. Their attitude rises with successful trades (especially if they get lots of profit) and falls when you propose deals they don't like. An easy way to capitalize on this mood system is to perform several partial trades. First trade for a few items, offering goods twice the value of the items you ask for (e.g. offer 2000☼ for 1000☼ of his stuff). This will likely make the merchant ecstatic about trading with you. Exit the trade screen, unpause briefly, and then return to trading with a vengeance. With the merchant in such a good mood, he is more likely to counteroffer than reject a trade outright. If you establish your hospital at the moment the first elven caravan arrives, or if you add the first coffers to it, your dwarves will take all of the cloth and thread they can carry off of the elves. Note that the civilization attached to a particular caravan will keep track of the value of items the caravan was carrying when they set out to trade, and they will compare this value with the value of items they return home with. Regardless of what method you use to confiscate items from a caravan, even if you came to possess the goods through no fault of your own (an ambush killed the caravaners, for example) the parent civilization may decide that you stole from them and send a siege instead of a caravan the following year. It is prudent to take measures to protect caravans visiting your lands! o You can also give away items, as gifts to the leaders of the civilization you are trading with. This presumably helps relations between yourself and the other faction, though there is not yet a clear correlation between the value of the offerings and the improvement to relations. The exact effects of offerings on trading are unknown but it is believed due to the offerings' net trade value being counted towards the traders' profit, possibly with a modifier (possibly a multiplier of more than 1 as a bonus or less than 1 to compensate for the improved relations)Verify, which in turn increases the quantity and variety of trade goods brought by next year's caravan. Also the King requires offerings to be made before his arrival. You cannot offer items that were not made at your fortress; the traders do not want your spare Goblinite clothes.. Unless you are looking for fun, under no conditions should you offer or trade items which are wooden or used wood in their creation (glass, for example) to elves, as this will insult the traders, and may cause them to leave or even damage relations enough to provoke a war between you and the elven civilization you traded with. They will be equally insulted by you trading back their wood-related items. On a similar note, if you have sold a large number of low value goods (such as all the loincloths and cloaks scrounged from a siege,) it can take a caravan months to pack it all up, to the point where they're still on the depot when the next one comes. An incoming caravan can occupy the same depot and trade with you, but if they both try to go through your entry tunnel at the same time they will become gridlocked against each other, resulting in the destruction of wagons and loss of trade opportunities. Create your trading depot inside your fort, preferably in the beginning. Place a 3-tile wide path (which must be free of obstructions such as stairways, traps, minecart tracks and boulders) to the entrance of the fort and position war dogs along it (chains do not block wagons); this will help to protect the traders and keep the depot close to your supplies. The war dogs will also catch any stealthy enemies who try to sneak in through the trade entrance. Selecting "only broker may trade" ensures that you will start negotiations with a decently-skilled trader, but also requires a significant wait while your broker makes his way to the depot (possibly months if he is "on break"). Selecting "anyone can trade" will result in a poorly-trained trader arriving immediately. Once your fortress is producing enough goods to buy out the caravan, waiting for your broker is unnecessary; allowing your commoners to trade spreads out the trading skill gains and eliminates the micromanagement of trying to get your broker to the depot in a timely manner. Each friendly race will send a caravan per year, linked to one season, which is autumn for dwarves, summer for humans, spring for elves, and winter for goblins. It is rare for your civilization to be on peaceful terms with goblins, however. In the first year, only a dwarven caravan will arrive, although it will only arrive in late autumn, about a month later than in previous versions. Caravans will only show up if that race considers the fortress site accessible (as denoted on the embark screen), with the exception of dwarves, who always arrive unless they are extinct.Verify Caravans appear to enter the map from a random direction which does not coincide with the relative direction of the originating civilization, and they may appear from different directions or z-levels each year. Caravans may leave without trading if it takes too long to reach the trade depot. Caravans will embark on their journey back exactly one month after their arrival, whether they have succeeded in reaching the depot or not. Also worth mention is the pathing behavior of the entire caravan. If one member of the caravan reaches a block in their chosen path (i.e. a raised drawbridge that was lowered when they entered the map) the entire caravan will re-path, instead of encountering the obstacle one by one. This behavior can be useful when attempting to free "stuck" wagons--a trader on foot encountering an obstacle will cause the stuck wagons to turn around and path to a different exit, if available. Be especially careful with reselling decorated items from other caravans, as non-wood/glass items may have decorations of wood or clear/crystal glass. All such items that elven caravans sell are also unacceptable to sell back to elves, as the dwarves have no means of proving that they were made in an "elf kosher" way. carries metal bars, sand, leather, cloth, wood, food and booze, ropes, waterskins, quivers, backpacks, metal weapons and clothing and armor, cages and a few domestic animals. carries only large-sized clothing, which is unusable by dwarves. A goblin caravan will only arrive if you mod the game, primarily because their entity lacks the entity tokens needed to make use of pack animals and wagons. That, and one of the tokens (presumably babysnatcher) makes them hostile to all non-goblin civilizations. These same caveats apply to kobolds. In the event that your leader is replaced, killed, or taken by a strange mood, the liaison may decide to leave your fortress "unhappy". Curiously, this will not occur if your leader is otherwise unable to perform the "conduct meeting" task. You can currently lock a liaison in a room and he will wait years to attend the meeting your noble is constantly conducting (and all subsequent diplomats appear to wait in line for the first to finish); this behavior is presumably a bug. While caravans can defend themselves, they don't like being ambushed. An encounter with unfriendly creatures resulting in the death of any merchant or pack animal will cause them to retreat and forget about trading with you for the season. Repeated caravan destruction (intentional or unintentional) will strain diplomatic relations and may result in a siege. Ambushing or seizing a caravan and letting a survivor escape seems to have a more detrimental effect than simply annihilating the whole caravan. Merchants can leave the map from any map edge-- including underground map edges. If an unobstructed path through your fortress reaches an edge, then blocking an overland path will cause the merchants to travel underground. This can be useful, if you're suffering a prolonged siege; it can also be dangerous, if your underground regions are less secure than your surface. Caravan guards cannot be starved, dehydrated, or driven to insanity if prevented from leaving, their employers and animals will however. If an large amount of items is sold / offered to the caravan, it may take a while to load it all, especially if you chose to keep your precious bins and traded your items individually. If a caravan attempts to leave in late Winter/early Spring, they may try to path over any large frozen body of water. If the water thaws while the caravan is on it, the caravan will become magically stuck in mid-air for the majority of the year (until the water refreezes). At this point, if they are still alive, they will leave the map normally. 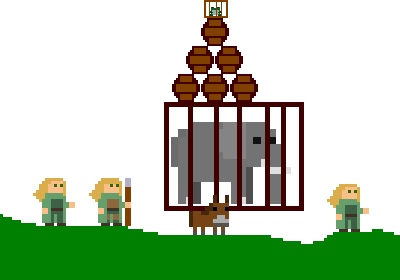 If you wait some time (2-3 monthsVerify), you can "claim" animals by linking a lever to the cage and opening it, the animals will be released in a tamed state. Check the unit screen before releasing them; if the creatures still show as Merchant creatures, they will wander off the map when released; if they show as Tame creatures, they will stay once released. This page was last modified on 29 May 2017, at 03:22.